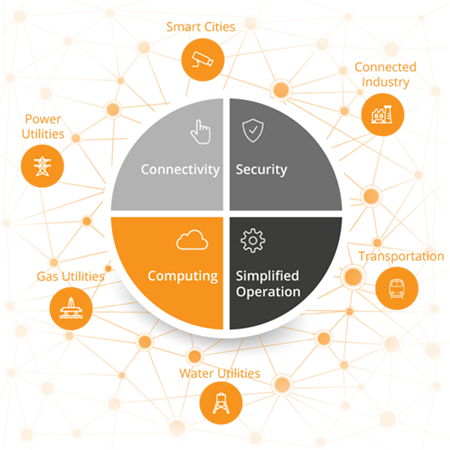 RAD offers a comprehensive solution for secure networking for Smart Cities, Connected Industry, Smart Transportation, Smart Energy (generation, transmission and distribution), and more, to allow fast, secure and economical deployment of thousands of new remote IIoT sites with always-on reliability and mission-critical protection. Ruggedized solution includes ring protection and optinoal PoE+ support to ensure uninterrupted communications within the substation and between SCADA control centers. Support all communication needs, including SCADA protocols, voice and new packet services (CCTV, VoIP, etc. The security of critical networks is at the center of attention of industry and government regulators alike. Check Point and RAD offer a joint end-to-end cyber security solution that protects any utility operational technology (OT) network by eliminating RTU and SCADA equipment vulnerabilities, as well as defends against cyber-attacks on the network’s control and data planes. With increasing numbers of service providers opting to use license-exempt radio frequency (RF) bands, the need to understand methods for overcoming the challenge of interference is critical. This white paper addresses the issue of interference in license-exempt bands and provides a number of approaches for its control and mitigation. Can MPLS-TP replace Ethernet in access networks? Is MPLS-TP ready to do so? This analysis compares the strengths and weaknesses of both protocols. Teleprotection signals from protective relays are among the most critical data transmitted across utility networks, as they help manage the power grid load, as well as to protect equipment within the power network from severe damages resulting from faulty HV lines. This presentation reviews the key challenges of industrial IoT (IIoT) deployments and RAD’s approach to address them, with an in-depth look at Edge Cloud Computing and how it can help a fast, secure and economic rollout of thousands IIoT gateways. The POWERful Choice: Carrier Ethernet or MPLS?